This is the final of the nava thirupathis and comes under the Pandiya naatu divyadesams of Sri Vaishnavas. The presiding deity is Sri Aadinathar in standing posture and he is swayambu moorthy. The thayars in the temple are Aadinatha valli and Kurugoorvalli thayar. 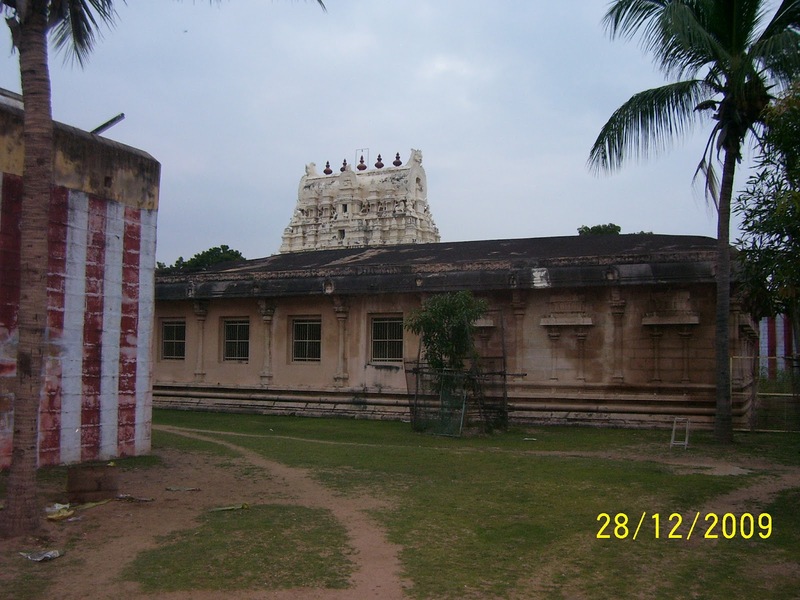 The temple represents the Guru sthalam in the nava graha kshetrams. The temple is also famous for the Ariyar sevai which involves the recital of divya prabandam with expression, music and rhythm. Apart from this temple town, Ariyar sevai is done only in Srirangam and Srivilliputtur. 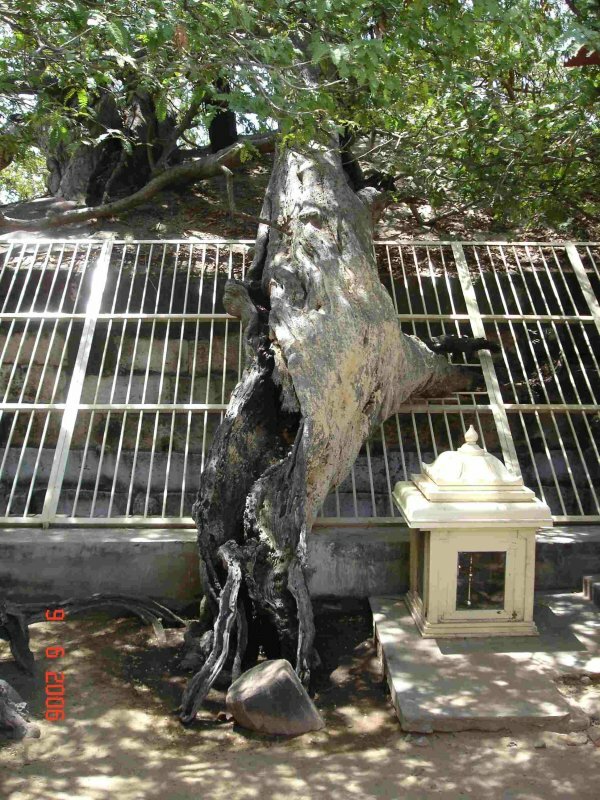 There is a tamarind tree inside the temple where Nammazhwar stayed for 16 years and there is a seperate sannadhi for Nammazhwar. It is believed that Lakshmana here is in the form of the tamarind tree. Another interesting feature of the temple is that Sri Ramanujar gives darshan here wearing white dhoti instead of saffron as wore by saints. 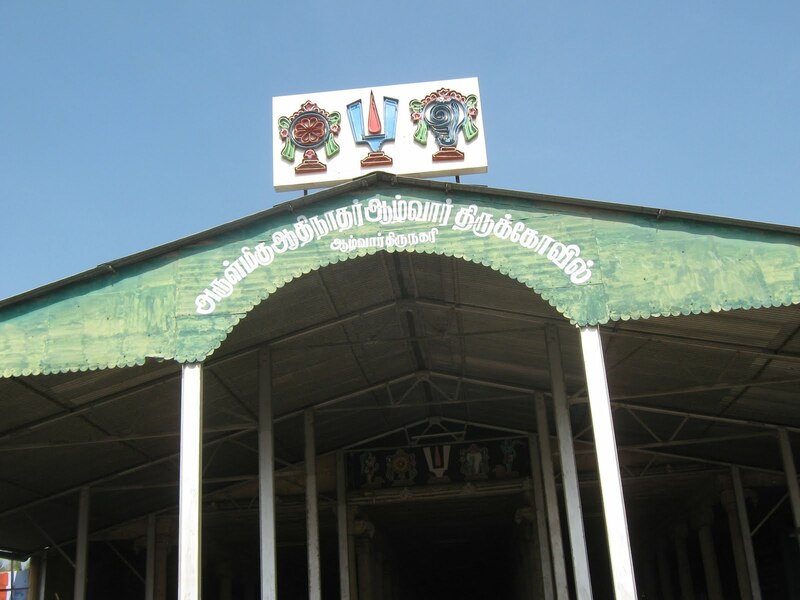 In Thirunelveli district, all along both the sides of Tanporunai (Tamirabarani), there are 9 sthalams and they are collectively and popularly called as “Nava Thiruppathigal”. Thirukkurugoor is the Avathara Sthalam (birth place) of Nammalwar. This sthalam explains his speciality and his works towards Vaishnavism and because of this, the sthalam is called “Azhwar Tirunagari”. Emperumaan, Sriman Narayanan says to Brahma that before producing him, he came to Porunai river and lived there. And said him to keep this temple as “Aadhi temple” (first and main temple) he should worship him. Like this he gives teaches (Ubhadesam) to Brahma as a Guru (Teacher) since, Sriman Narayanan acts as a Guru for Brahma, this sthalam is called “Kurugoor”. Kuru means do this is the meaning. Since, Narayanam asks Brahma to do the tapas and his workship towards him, this sthalam is called “Kurugoor”. The Moolavar, Aadhinarayanan has very big thirumeni (body) and he came on his own (Suyambu) its not done the Pradhishtai (installed). The feet of the Moolavar comes up inside from the Earth. Devendran – Indiran finally got out from Sabham (Sabhavimotsanam) after worshipping the Aadhinadha perumal. He got the sabaham from his parents because he is not treating them well and obeying them. In this sthalam Lakshmanan (brother of Sri Ramar) did pradhistai (made) himself as “Tamarid tree” and in that tree Emperumaan lives in Bramacharya stage. Once, periyapiratti comes there and asked Narayanan to marry her. At that time, Narayanan converts her as a flower and wear on his body. In pramadhi year, Vaikasi 12th day in Valarpirai – Pournami, friday, Nammalvar was born to vellalar and Udaya Nangai. When he born, he didnt cry or open his eyes and didnt drink the Mother’s milk. This is because when the Sadavaayu (Air) went inside the body of Udaya Nangai, he made that not to enter and push him out. Because of this, Nammalwar is popularly named as “Sadagopar”. He doesnt open his eyes because he doent wanted to see anyone except Sriman Narayanan, and the same way he wants to speak only about Emperumaan, so he doesnt open his mouth to cry (or) to drink milk. His parents were worried about him thinking he might be retarded (Jadam). So, they brought him to Aadhinadha perumaltemple and named him as “Maaran”. At that time, closing his eyes, he goes near to the Tamarid tree and sits there in Yoga stage till the age of 16. At the same time, Madurakavi Alwar starts his Bhakthi Yaatra towards Ayodhya, Vada Madura, Gaya, Kasi, Kanchi, Avanti and Dwaraka. He was born in Tirukkoloor as an ordinary Andhanar (Brahmanar) and was well knowledged in Sanskrits. When he was travelling to Ayodhya, a flashy light arised in the sky which directed him along the south direction. He followed the light and finally it disappeared in the Thirukkurugoor Aadhinadhar temple. On entering the temple Madhurakaviyaar found and surprised at Nammalvar, being 16 years old child in Yana nilai (thyama Stage). He went close to Nammalvar and made some noises to awakes him from the thyanam. Then Madhukaviyaar questiontioned Nammalvar that how the life (Aathma) live and what it is eating to live? For this, Nammalwar said “Atthai thindru Angae Kidakkum”. This means that the body is made up of Panjabhootham (5 Universal parts). Inspite it is found in earth, it lives only by the thinking and experience on Paramathma (Sriman Narayanan) and this how our life lives and it should be only in such a way. On hearing this, Madhukaviyaar was so happy that he had got a wounderful teacher (Aasaan) and raised his hands over his head and started to praise him in songs. At that time to open the eyes of Nammalwar, Emperumaan as “Sangu Chakradhari” along with Lakshmi samethar gave his dharshan. Along with Nammalwar, Madhurakaviyar got the dharshan of Emperumaan in Nindra Kola seva. Since, Madhurakaviyaar was able to get the seva of Emperumaan, he assumed Nammalvar as his emperumaan and started to worship him. This is no selfishness with Sriman Narayanan, because of this only his bhakthas call him as “Emperumaan” thinking he is for them. Like the same way, since Nammalwar doesnt live for him and his thinking is always on Narayanan, Sadagopar was named as “Nammalwar”. Nam – means ours. Nammalwar sat beneath the Tamarid tree and did mangalasasanam for 35 divyadesam through his “Gnana Eye”. This Tamarid tree with some holes can be seen now, too. This tree is called as “Puliyalwar”. Daily Thirumanjanam is done beneath the Tamarid tree. The utsava moorthy, Nammalwar is giving his seva in Golden sannadhi (small one) in Sobhana Mandapam. Before starting the Ramayana, Kambar wrote “Sadagopar Andadhthi” by keeping down his head towards Nammalwar. On the south mada veethi (street) Thiruvenkada mudayan – Sri srinivasar sannadhi and west mada street, is Thiru Aranganathan Sannadhi and on north mada street, Ulagaccharyar, Azhagar, Vedantha desikar, Manavala Maamunigal, Andal sannadhis are found. The one more speciality si Udayavar Ramanujar wears white colours dress rather than wearing saffron colour. (Rishis wears only saffron coloured dress). The Sadaari, which is kept on our head in all of the Vaishnava temples is said to be Thiruvadi (feet) of Emperumaan and it is the Nammalwars shape (or) dimension. He is explaining the world that he acts as the dust which is found below the feet of Emperumaan. Travelling a distance of 1 mile away from this sthalam, we can find “Appan Sannadhi”, where we can find the sannadhi for Kaarimaran, father of Nammalwar. Sthala Virutcham (tree) of this shtalam is Tamarind tree. Araiyar Sevai : This is one of the three Divya Desams in Tamil Nadu where Araiyar Sevai, the visual song and dance enactment of the ‘Paasurams is still being performed. Morning 6.00 A.M. to 12.00 Noon. Evening 5.00 P.M. to 8.45 P.M.